“Successful completion of the proposed experiments could lead to novel anti-cancer therapies that could potentially improve the prognosis for cancer patients and reduce the public-health burden from cancer,” said Dr. Robert Leng. A University of Alberta researcher in the Faculty of Medicine & Dentistry may have found a new target for cancer therapy. One of the most important genes in the human genome is called p53 and its function is to suppress tumors, says Roger Leng (pictured), a researcher in the Department of Laboratory Medicine and Pathology. 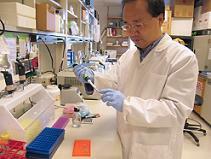 Leng has discovered the mechanism by which p53 is inactivated in cancerous cells, allowing tumors to grow. It has long been known by scientists that another protein, MDM2, lowers p53 in the body but in cancerous cells p53 is inactivated in more than 50 per cent of all human tumors. MDM2 does not have the ability to functionally silence the tumor-suppressing protein on its own, leaving scientists wondering what molecule in the body is helping MDM2 to nearly eliminate p53 in cancerous cells.